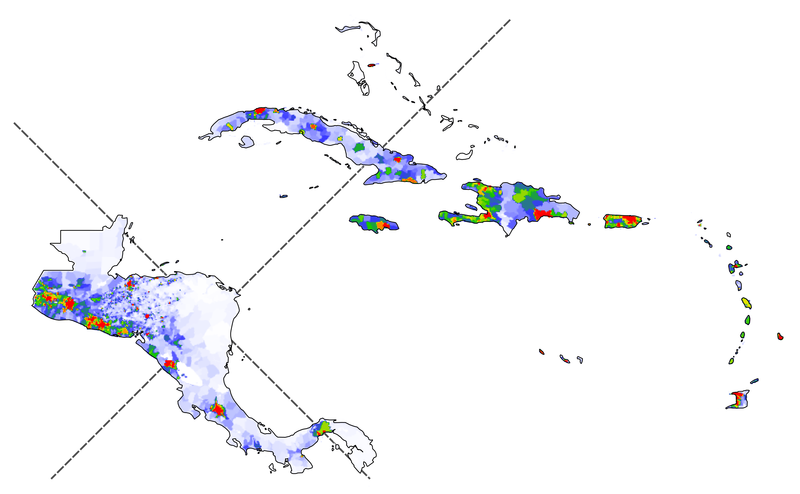 The Caribbean, as usual each line divides the population in half. Clearly there’s treasure buried at the X – someone tell Johnny Depp! The Jamesgeo Population Cross for New Zealand – each line divides the population into halves. I think this is the most aesthetically pleasing population density I’ve ever seen! Red areas have the most people and light blue have very few. White areas are virtually deserted. 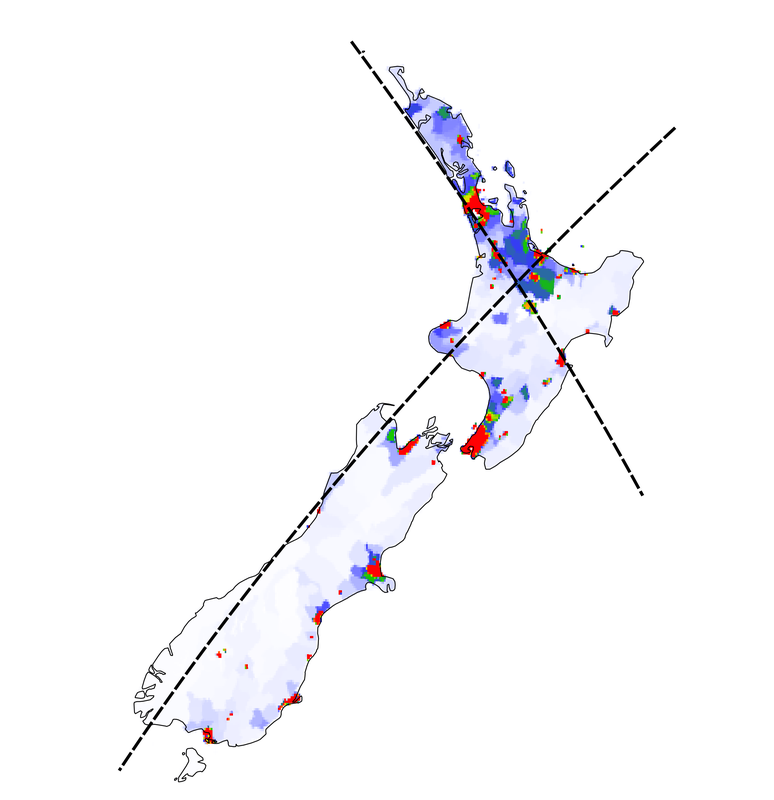 Most people live in the north of the North Island – almost the exact opposite of the UK. In the last post we came to the surprising conclusion that Newcastle is in the West. This is because the UK is tilted, yet we think of the East coast as running due North. To match the population axes to our perceptions I have rotated the axes by 28 degrees. Generalising this creates the jamesgeo population cross, a crude indicator of population distribution. Split the population in half twice – once parallel to this axis, and once perpendicular to it. Display in a local projection to get a true country shape (at the expense of the lines becoming curved, and the angle between the lines not looking like a right angle). Optional: Measure the distance (displacement) of the jamesgeo population cross from the centre (centroid) of the country. 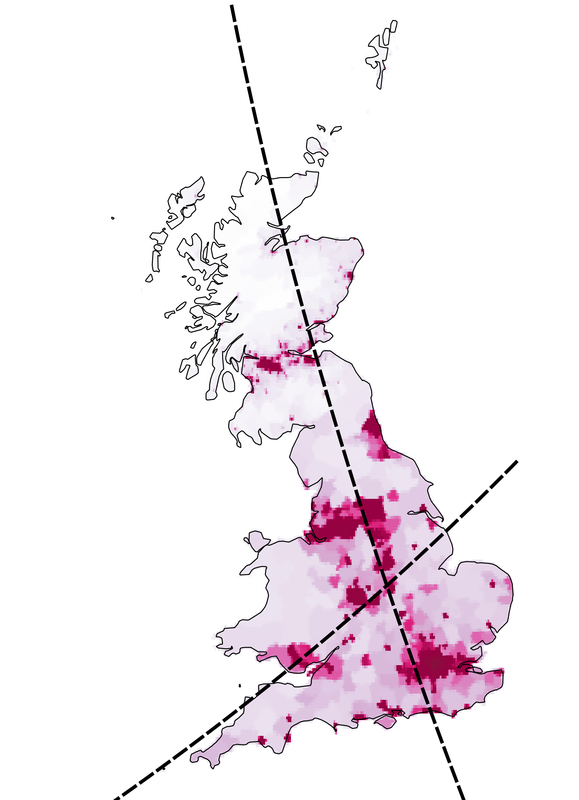 Each line on the jamesgeo population cross splits the area’s population into two equal sections. 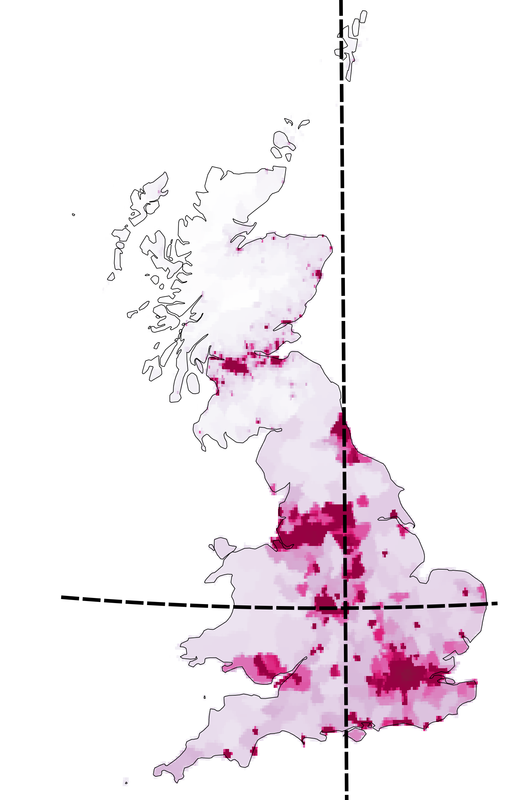 Just NW of Leicester is the centre of Great Britain’s population density. So every thing’s back where it belongs… just in time for the New Year. Junction 3 of the M6 is the centre of Great Britain’s population. Given the traffic jams, this may well be true! This centre point is about 5km from Coventry, making Coventry the best place to live if you’d like to visit the rest of your compatriots. Perhaps a new definition for being sent to Coventry? Happy Christmas to all jamesgeo.com fans… especially those on the M6!